The San Francisco Ethics Commission voted unanimously that it once again failed to have crafted legal rules regarding so-called independent committees like “Progress for All”, aka “Run Ed Run”. The Commission’s decision that it had failed to consider situations like the Run Ed Run campaign came just two months after it voted that it had failed to consider whether the city’s Sunshine Act rules applied to city commissioners. The admission that it has failed to address controversial political activities and good government requirements comes at the same time that the Commission has asked the Board and the voters to grant it authority to rewrite the city’s law regarding political consultants. That proposal will be on the November ballot. 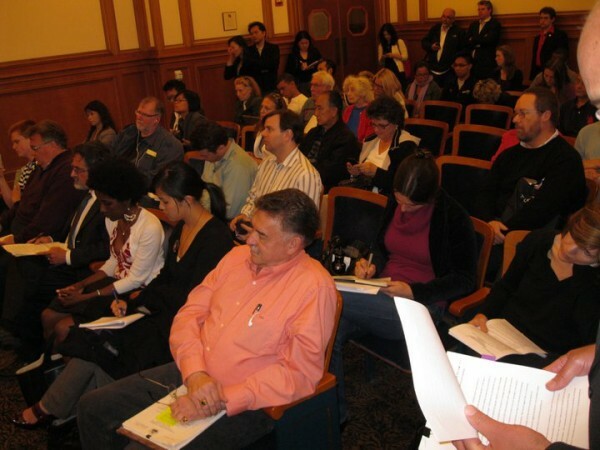 The Commission sidestepped all factual issues involved in the Run Ed Run effort, including whether there was a factual basis for the claim or the denial that Mayor Ed Lee was in collusion or that the group acted on his behalf. One commissioner raised the issue that normally the Commission does not undertake such decisions without an investigation of the underlying facts, but that no factual record was presented by the staff. The Commission also did not suggest that an investigation of the facts surrounding the Run Ed Run campaign be undertaken. At issue is the close relationship between that effort and Lee himself, including the role that such backers as Rose Pak and former mayor Willie Brown played in orchestrating Lee’s initial appointment as interim mayor. Enrique Pearce, the manager of the Run Ed Run campaign, submitted a letter to the Ethics Commission stating that the committee will continue to operate through the election season, albeit no longer aimed at encouraging Lee to run for his own term as mayor. Instead it will work, Pearce’s letter stated, as an educational outreach on ranked choice voting and to encourage more residents to register to vote. A starting point might be to encourage Rose Pak to register to vote, something she has not done, according to the San Francisco Registrar of Voters. While Pak has been glorying in her role as Lee’s mentor, so far no one has asked why she herself apparently failed to register to vote. Pak also has failed to register as a consultant, a requirement for all consultants doing business in the city. CitiReport arranged for the Ethics Commission meeting to be videoed by Tony De Renza, and it can be viewed here. The first video is from the discussion of the Run Ed Run portion of the meeting. Later CitiReport will post the sections of the meeting dealing the the Ethics Commission’s response to the Civil Grand Jury’s report “Sleeping Watchdog” regarding the performance of the Commission. Next post: Ed Lee: Freight Train or Train Wreck?